In Poland it is lody, in Czech it is zmrzlina. We have been trying it out so that we can reliably report on its quality. We can say that it is good and visitors to these parts are recommended to eat it. Zmrzlina with hot raspberry sauce is the best. Today was hot, and after a long hot ride yesterday we needed a day off the bikes. We took the train from Slavonice to Telc, 26 km in 55 minutes. 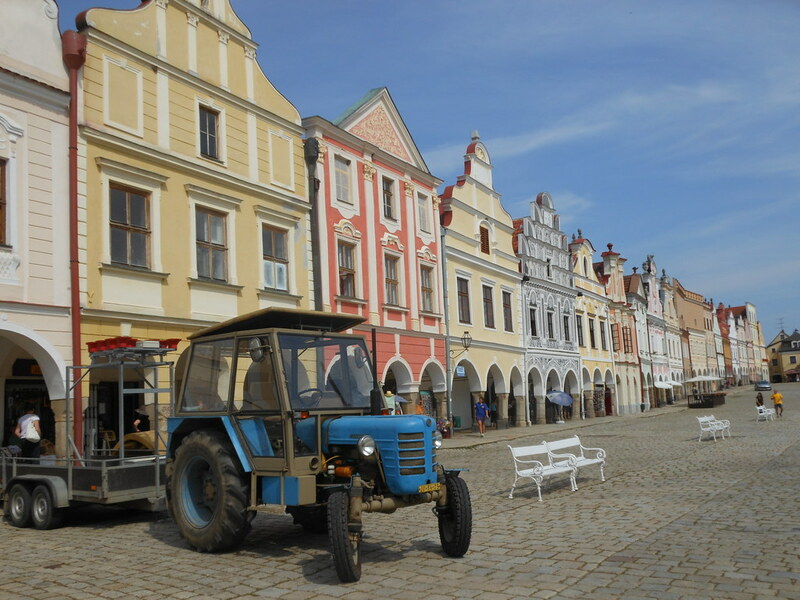 Telc is famous for its magnificent town square with pastel coloured gables. It is surrounded by lakes and parks. There are cycle tourists everywhere and normal tourists as well. We climbed the tower of St Jacobs church which gives good views in all directions over the town and surrounding countryside. This tower would be an OH&S nightmare for any Australian local government. It includes a stage near the top where the roof is under 5 feet high – a bit like in Being John Malkovich – and the railings around the viewing platform are not especially robust. However no injuries were sustained today! It was reassuring to see some reaping occurring in the fields. There is a lot of this to be done and I have been wondering how they will manage it all. I guess it’s all in good hands with EU reaping regulations to be followed. Route planning has been on the agenda. 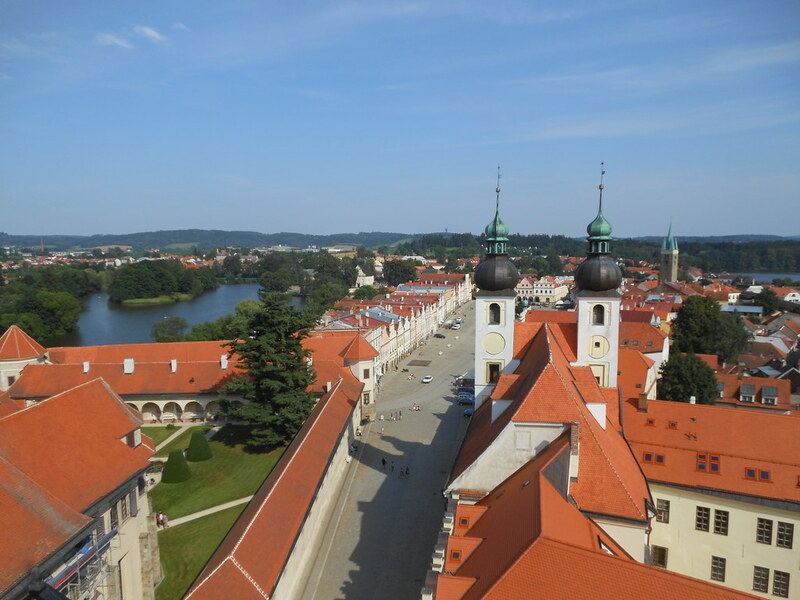 The result of this is: tomorrow we will head in the direction of Cesky Krumlov, another UNESCO listed historical town. This entry was posted on 25 July 2012 at 11:42 am and is filed under Czech Republic. You can follow any responses to this entry through the RSS 2.0 feed. You can leave a response, or trackback from your own site.